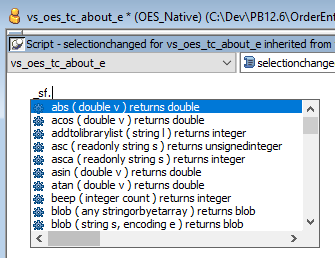 The PowerBuilder IDE has a great Auto-Scripting feature. However, it does not address PB's built-in commands. Sometimes also referred to as Global Functions. These commands though are used in a plethora of places in the average App. Without AutoScript support though, it can be a laborious journey through the PB Help sub-system to quickly extract what you need to know. Click here to watch ... Enjoy! I tried this, Chris, but there are a couple of things I don't like about it. The first is that you don't get a popup until you have typed enough of the function name to be unique. (Maybe that's how Autoscript works in general - I really haven't used it before.) But my bigger concern is the statement "SF.function will compile but it won't run". That leaves one very error prone to forgetting to remove SF. and having your program crash because of it. If you do no see the immediate pop-up like you see in my demonstration video - then, you might need to check your auto-script settings. Makes sure that things like "Show Return Type" and "Automatic Pop-up" are ON and "Activate Only After Dot" are OFF. Yes, the SF.xxxx() will fail but it won't take you long to remember to clear the "SF." 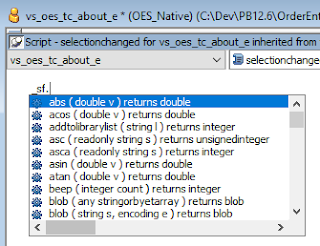 syntax before saving (as I emphasize in the video). Remember though that this is only a "work Around" until Appeon updates the AutoScript feature in PowerBuilder.